Like the A-body Chevrolets with which they shared some body components, the 1955 Pontiacs were all new. Frames, bodies, and windshields were all altered, and the nameplate debuted its much-delayed but thoroughly modern V-8. Overnight, Pontiac’s engines went from 115- and 118-hp six-cylinders and 122- and 127-hp eights, to the 173-hp, 180-hp and 200-hp “Strato-Streak” V-8s that displaced 287 cubic inches. The Star Chief was the brand’s premier model, and rode on a wheelbase that was two inches longer (124 inches in all, excepting the station wagon) than other Pontiacs. The Star Chief was offered as a 4-door sedan, a convertible coupe, a Catalina 2-door hardtop, and a Safari station wagon, and in either Deluxe or Custom trim depending on what type of upholstery buyers desired. Prices started at $2,362 for the 4-door sedan, which was quite a step-up from the upper-end Chevrolet Bel-Air sedan ($1,932), and neatly placed at the exact same price as the least expensive Oldsmobile 88 sedan. For 1956, Pontiac made detail changes to the cars, but the most important news was under the hood, where the V-8 engine was bored out to 316.6 cubic inches, with power now rated at 192, 216, 227 or 205 hp depending upon selected transmission and carburetion. A 285-hp option also joined the lineup in January, with this engine featuring a 10:1 compression ratio, a “hot” cam, special lifters, and dual four-barrel carburetors. 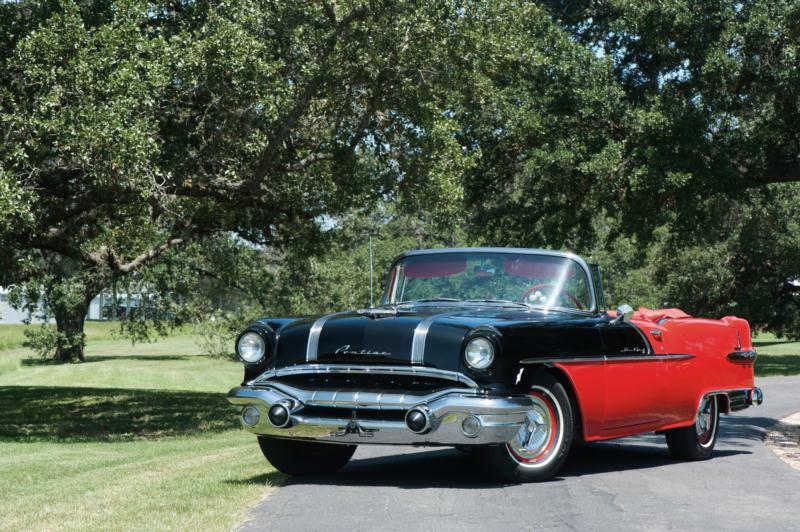 The 1957 model year saw Pontiacs grow in length, with a substantial restyle, plus a new Bonneville convertible line taking the top rung away from the Star Chief series. This year, Pontiac engineers stroked the engine out to 347 cubic inches, with power ratings for the Star Chief being 227, 252, 244, 270, and 290 hp (the first of Pontiac’s famous tri-carburetor engines). Advertisements touted the Star Chief’s “man-sized comfort” and “barrel-chested Strato-Streak V-8,” which neatly captured the car’s appeal. Today the Pontiac Star Chief is a highly collectible car. 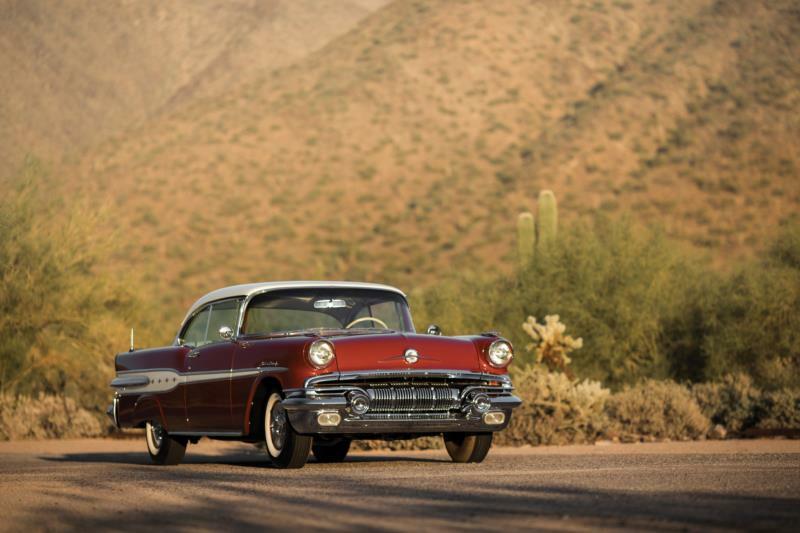 Like Tri-Five Chevys, each model year has its own adherents, with 1955s being popular for fewer embellishments and 1957s liked for their extra glitz. Safari wagons are particularly prized due to their rarity (fewer than 10,000 were built), though other Star Chief body styles are rather easy to find. Performance was great for its day and still holds up well in modern traffic, and ownership is relatively straightforward from a maintenance standpoint, all of which results in a fun and rewarding car to have.